If you’ve ever been in a conversation about eating and hunger, you’ve probably heard that phrase. “Stretching your stomach” refers to the idea that eating more food will expand your stomach over time, leading you to feel hungry more often and requiring more food to quiet said hunger. It sounds like it might make sense, but the human body works in mysterious ways. Does science back up the claim that eating more food stretches your stomach? And does cutting back on food really cause your stomach to shrink? STACK investigated this common eating question. The answer to these questions sits in our stomachs. The average human stomach holds a volume of about 200 milliliters in a fasting state. This baseline holds true whether a person is obese or not, since body size and stomach size are not correlated. However, when we prepare to eat, our brain sends a signal to our stomach that food is on the way. In anticipation, the stomach muscles relax and the stomach gets ready to be filled with food—a process known as “gastric accommodation.” While eating, the average human stomach can stretch up to five times its normal fasting state. “The human stomach can actually hold 48 ounces, or roughly one liter, at its full capacity,” says Leslie Bonci, a registered dietitian who works with the Pittsburgh Pirates and Kansas City Chiefs. Regarding stomach distensibility, how you eat is the most important factor. 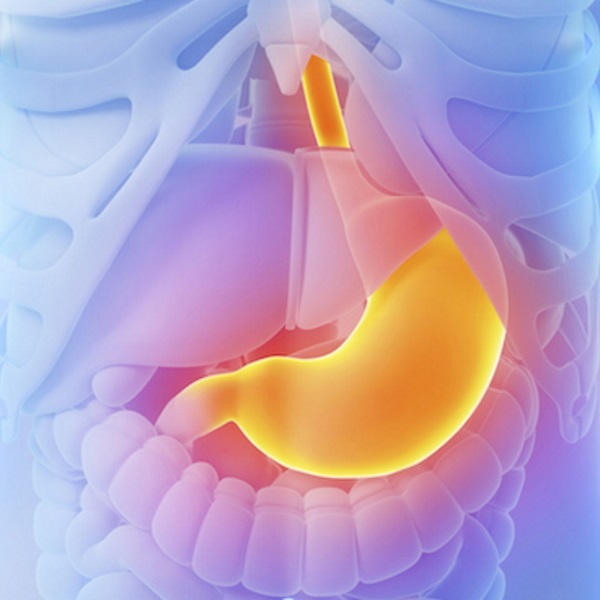 Several studies have found that eating habits have a strong effect on gastric capacity. Similarly, reducing binge eating and overall calorie consumption can decrease the stomach’s ability to expand. A 1996 study found that limiting obese participants to 1,000 calories per day for one month reduced their peak stomach capacity by 36 percent. The fact that gastric capacity is more related to binge-eating behavior than to body weight shines light on many lingering questions about eating. It’s why competitive eaters can look like lanky pencil-necks but put away mountains of grub. It’s why most doctors and dietitians recommend eating several small meals throughout the day instead of two or three massive ones. Although everyone’s stomach is relatively the same size, their stomach distensibility is not the same. It also takes a lot of time to change one’s stomach distensibility. You’d have to eat larger-than-usual meals for several weeks in a row in order to increase the degree to which your stomach can expand. That means a few days of stuffing yourself over the holidays probably won’t “stretch your stomach”—at least not to a point where it will make a difference. The foods we eat go through our stomachs, but our brains play an important role in hunger, eating and satiety. Once your stomach stretches to a certain point during eating, it sends a signal to your brain that you’re no longer hungry. But when binge-eating and eating beyond the point of satiety becomes the norm, that natural neural reflex is weakened. The speed at which you eat also has an effect on your stomach’s signaling to the brain. The “I’m full” signal takes a while to kick in, so eating fast can lead people to overeat before they realize what they’re doing. Then a couple of minutes after the meal, boom! Their stomach suddenly hurts and they feel uncomfortably stuffed. While the distensibility of your stomach is important to hunger, the habits of overeating and getting comfortable with overeating have a profound effect on the brain. Whether your goal is to “stretch your stomach” (increase your distensibility) or “shrink your stomach” (decrease your distensibility), the volume of the food you eat will have a lot to do with it. “Most people feel hungry on small amounts of food. But the real problem isn’t just the volume of the food, but how that volume is composed,” Bonci says. Calories come in many forms. When you eat potato chips, you consume lots of calories but little volume. Fruits and vegetables, on the other hand, comprise more volume for fewer calories. These “high-density” foods help you fill up your stomach more efficiently than “low-density” foods like potato chips. There’s actually an entire diet built around eating high-density foods. It’s called the Volumetrics Diet. It preaches eating foods high in water, such as fruits, veggies, soups, stews and chilis, so the stomach feels satisfied without taking in copious amounts of calories. If you think your stomach is “stretched out” and you feel constantly hungry, up your amount of high-density foods. Focus on eating several small meals throughout the day and eat slowly. Soon enough, you’ll find your stomach distensibility has decreased and you’ll be hungry less often.